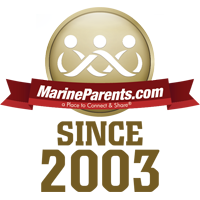 MarineParents.com, Inc., an IRS-approved 501(c)(3) public charity eligible to receive tax deductible donations, was founded on January 21, 2003. Semper Fidelis Marine Corps Families! Thank you for opening and reading this edition of our weekly newsletter. We've got great articles to share with you this week. With autumn approaching, it's almost that time of year during which we take the time to honor and show our support of Gold Star families and reflect on the sacrifices they've made. This time for reflection is also a good opportunity to look at what's going on in the Corps currently, as well as a chance to look at what Marines have done at this time of year in the past. We hope you enjoy! Thank you for your continued support of our brave men and women in uniform. Show Your Support to Gold Star Family Members Nationwide. 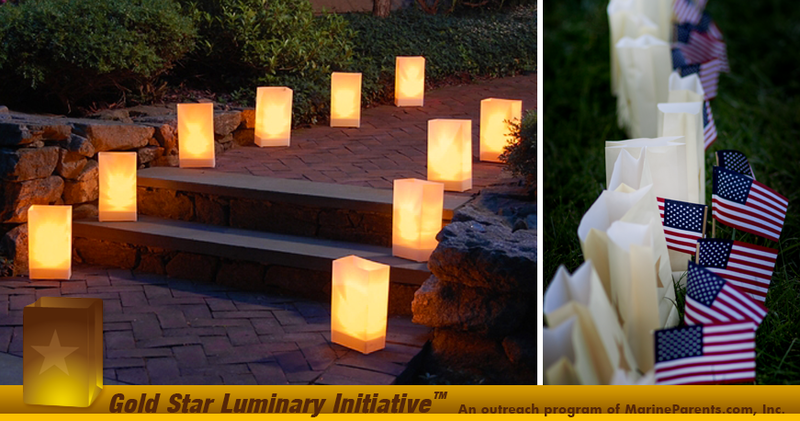 The mission of the Gold Star Luminary Initiative is to promote awareness of Gold Star Family Day and urge organizations and individuals in communities throughout the United States to light luminaries at dusk on the last Sunday of each September in honor of our fallen heroes. This year, Gold Star Family Day is September 25, and we would like to encourage you to show your support to Gold Star family members across the country by taking the Gold Star Luminary Initiative pledge! T AKE THE PLEDGE TODAY! 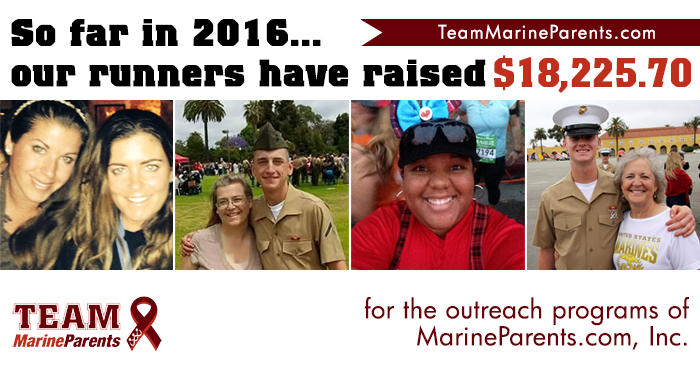 Here at Marine Parents, nothing we do would be possible without our amazing volunteers across the country. This week's featured volunteer is a proud Marine father from Maryland--Paul Schilling. 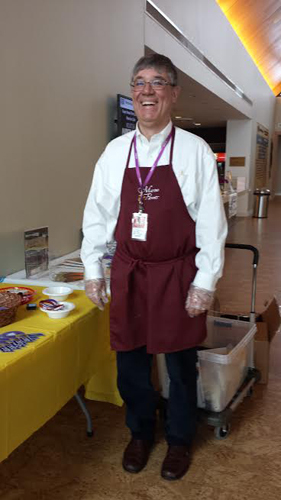 Paul has been volunteering with Marine Parents since 2008, i nitially volunteering with Purple Heart Hero Support (now the Warrior Support Team) to serve monthly Sunday evening dinners to recovering warriors and their families at Walter Reed National Military Medical Center (then known as "Bethesda"). At that time, the hospital's food service facilities were closed on Sunday evenings and families who were unfamiliar with the area found it difficult to find dining options that allowed them to stay close to their Marines. *Image info: Paul Schilling. (Image used with permission). Last Thursday, August 18, saw Marine Corps Air Station (MCAS) Cherry Point, North Carolina celebrate its 75th anniversary. On August 18, 1941, then-Commandant of the Marine Corps Lieutenant General Thomas Holcomb penned a letter establishing "Air Facilities under Development at Cherry Point." That same day, Lieutenant Thomas J. Cushman, the base's first commanding officer, reported for duty with four enlisted Marines. In the three-quarters of a century since it's founding, MCAS Cherry Point has become largest Marine Corps Air Station in the United States. 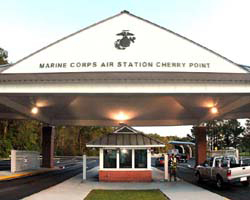 *Image info: MCAS Cherry Point front gate. (USMC photo/released). 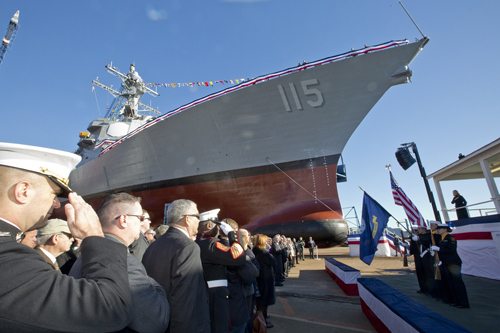 On October 31, 2015, the Navy christened the USS Rafael Peralta, in a ceremony that took place at Bath Iron Works in Bath, Maine. The ship is named after Rafael Peralta, a Marine Sergeant who was killed at the age of 25 after being shot in the head and smothering a grenade with his body while clearing a house in Fallujah, Iraq in 2004. Peralta was awarded the Navy Cross, the nation's second highest award for valor, for his actions. Recently, Navy officials have announced that the destroyer will be commissioned in the summer of 2017 in San Diego, California, but an exact date has yet to be set according to Navy Lieutenant Eric Duprie, a spokesman for Secretary of the Navy Ray Mabus. Peralta's mother, Rosa, is the ship's sponsor. *Image info: U.S. Marines, Sailors, and guests honor the American and Navy flag during the USS Rafael Peralta christening ceremony at General Dynamics Bath Iron Works in Bath, Maine, October 31, 2015. (USMC photo by Sergeant Gabriela Garcia). 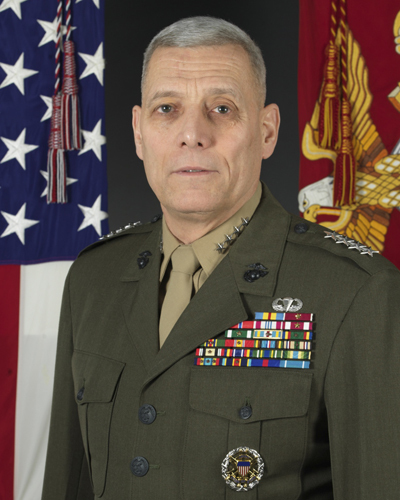 Earlier this month, on August 5, General John Paxton, the longest-serving Assistant Commandant in Marine Corps history, retired after 42 years in the Corps. assumed the role of Assistant Commandant in late 2012, serving in that capacity for nearly four years under three different Commandants. *Image info: General John Paxton . (USMC photo/released). 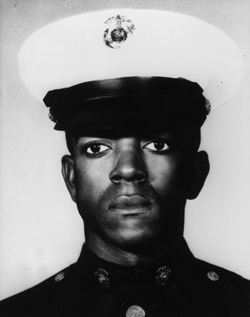 Forty-eight years ago this week, on August 21, 1968, Secretary of the Navy Paul R. Ignatius posthumously awarded the Medal of Honor to Private First Class James Anderson Jr. for heroism in Vietnam, the first time an African-American Marine received this medal (and one of only five African-American Marines to ever be awarded this medal). The award was received by his parents, Mr. and Mrs. James Anderson, Sr., at Marine Barracks 8th & I, in Washington D.C. This event was also notable in that it indicated the Marine Corps was evolving and that some of the long-standing prejudices within the Corps (namely those against minority Marines) were being eroded. *Image info: PFC James Anderson Jr. (USMC photo/released). Thirty-two years ago this week, on August 23, 1984, the last Marines to serve on peace-keeping duty in Lebanon arrived back in Ameria. The 24th Marine Amphibious Unit (MAU) arrived off the coast of Lebanon on 9 April to relieve Marines of the 22nd MAU, who were guarding the U.S. Embassy in Beirut. The 24th MAU left Beirut on 31 July, marking the end of U.S. combat troops in Beirut for the first time since Marines had entered the city almost two years earlier. 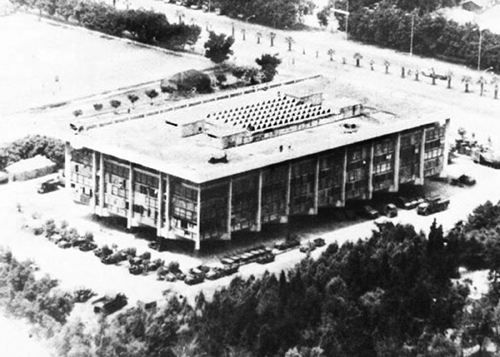 *Image info: The Marine barracks building in Beirut, Lebanon. (USMC photo Courtesy of II MEF/released). Two hundred and two years ago this week, on August 24, 1814, Captain Samuel Miller led a detachment from Marine Barracks, Washington, in the Battle of Bladensburg, Maryland in defense of the nation's capital. After fighting back three British charges, Captain Miller was wounded as British forces began to flank the Marines, forcing the Marines to retire to avoid capture. Eight Marines were killed and 14 were wounded. 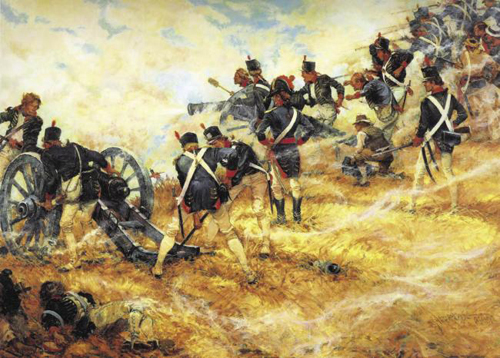 *Image info: "The Final Stand at Bladensburg," by Colonel Charles Waterhouse, USMCR (Ret), depicts Marines, as part of Commodore Joshua Barney's naval battalion, manning 12-pound guns at the Battle of Bladensburg, Md., 24 Aug. 1814. (Public domain image/released). 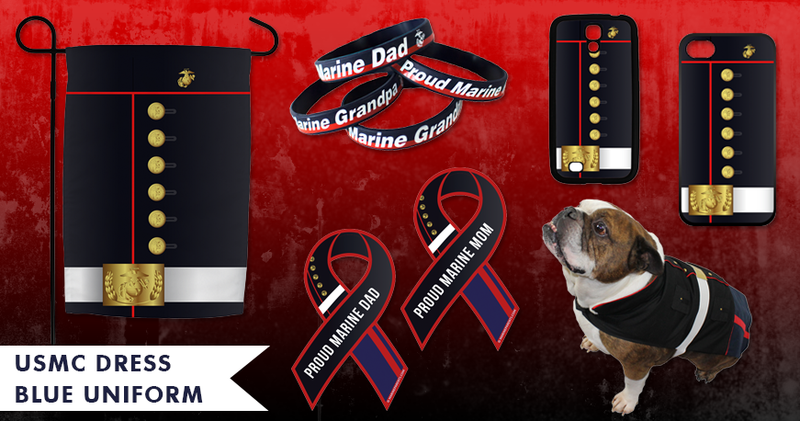 Check out MarineParents' Marine Corps Store: The EGA Shop! At EGAshop.com, 100% of the proceeds benefit the outreach programs of MarineParents.com, Inc.